Baked Butternut Squash with Bacon and Sage, Thyme for Cooking side dish. There is a group of cooks that feel almost anything can be improved with bacon. I'm one of them... Within reason. 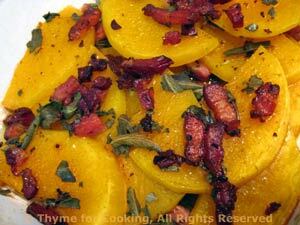 I love the combination of salty bacon or ham with sweet squash and spicy sage. And I love easy vegetables. This started out to be a gratin, but I decided to leave the topping off, some things are best simple. Remove, drain on paper towels for a minute, then crumble. Cut squash into slices about 1/4" (.6cm) thick. Lightly oil the bottom of a baking dish large enough to hold the squash. I used an 8" (20cm) round glass dish. Make a layer of 1/3 of the squash slices. Sprinkle with 1/3 bacon and 1/3 sage. Pour chicken stock over the top, cover and bake for 25 minutes, 400F (200C).